Colleen Atwood: To Design The Costume, Understand The Character Before Atwood was an Oscar-winning designer, she was a 17-year-old mom working in a French fry factory. Atwood says knowing all different kinds of people helps her in her work today. 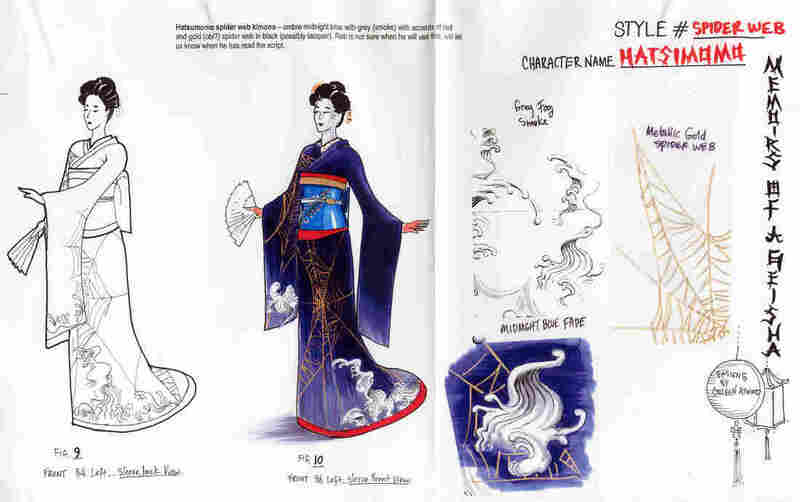 Costume designer Colleen Atwood has won three of her 11 Oscar nominations, including one for her work on the 2005 film Memoirs of a Geisha. Atwood designed the costumes for the 2012 film Snow White and the Huntsman as well as the 2016 The Huntsman: Winter's War (above), which stars Emily Blunt as Queen Freya (left) and Charlize Theron as Queen Ravenna. Working steadily since the 1980s, she's dressed characters from the past and the future — the Middle Ages for Into the Woods, the Civil War for Little Women all the way to Gattaca and the 2001 Planet of the Apes. Her latest movie, Miss Peregrine's Home for Peculiar Children, is her eleventh with Tim Burton. It travels back in time to Wales during World War II. 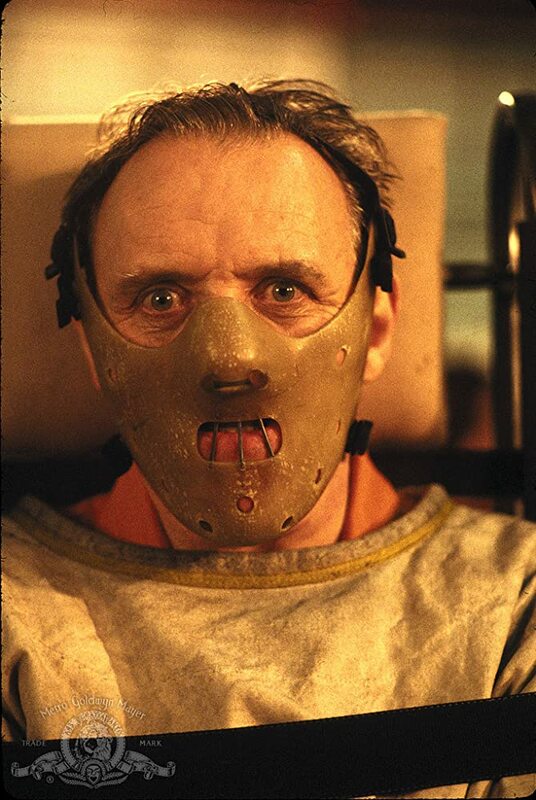 Costume designer Salvador Perez passes Atwood's costumes — on display at Universal, where he works — every day. "I get to walk by and see her costumes from The Huntsman," he says, "and every day that I look at those costumes I see a different detail that I didn't notice before. There are so many nuances to her costumes. How her brain works fascinates me." Atwood is known for costumes that are rich in detail — which she adds even when she knows those embellishments might not be visible to audiences. In preparation for a film, she studies what might have been in a character's closet and searches for the right materials. For years, one of her go-to places has been B&J Fabrics in New York's garment district. "As a young designer I never had enough money to buy the fabric that they, but they were always very kind to me, and helped me find fabric that I could buy," she remembers. 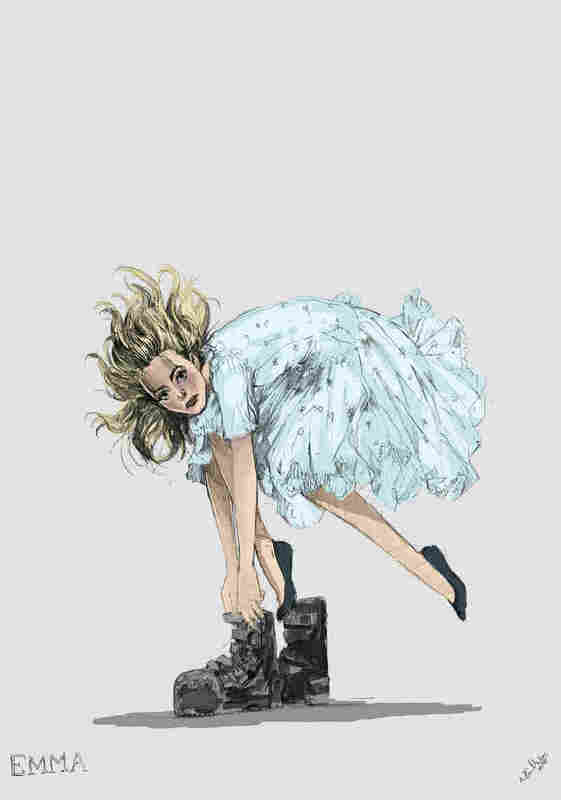 This is Atwood's sketch for Emma, a character from Miss Peregrine's Home for Peculiar Children. You can see how that costume turned out in the photo below. B&J Fabrics is a family run business founded in 1940. Today, in its vast space on the second floor of an office building, bolts of fabric of every color and texture are stacked up to the ceiling. Atwood heads straight for a rack of delicate, lacy samples embellished with feathers and rhinestones. Her next movie is about a circus, set around 1920. So she's looking for materials that will convey the period but also allow easy movement for today's acrobats. "Back then, they didn't have so many stretch fabrics," she says. "So they were quite corseted. ... The challenge with this is to make it look old but make it work like what they're used to working in, which is stretch, stretch and more stretch." Atwood settles on two samples: a black piece with strands of shiny black beads, and a silver piece embroidered with turquoise beads. She loves them: "Instant glamour. Instant showbiz," she says. 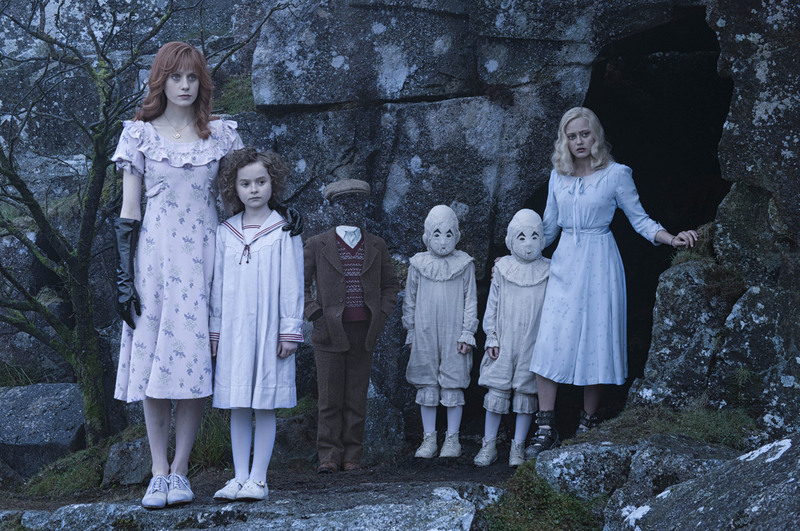 Olive (Lauren McCrostie), from left, Bronwyn (Pixie Davies), Millard (Cameron King), the twins (Thomas and Joseph Odwell) and Emma (Ella Purnell) are some of the "Peculiars" in Miss Peregrine's School for Peculiar Children. Atwood grew up in Quincy, Wash., a small town in farm country. She says she was always encouraged to nurture her artistic side, and that both of her grandmothers were also creative. "One of them was from a little bit wealthier background and had tremendous style, and was an amazing gardener, and kind of lifestyle artist," she says. "And my other grandmother was really a hard scrabble, Irish grandma who taught me how to sew and how to do crafty sort of things and make things work. I think the combination of the visual sense and practicality have a lot to do with who I am today." Atwood says that her artistic side was always nurtured, particularly by her two grandmothers. 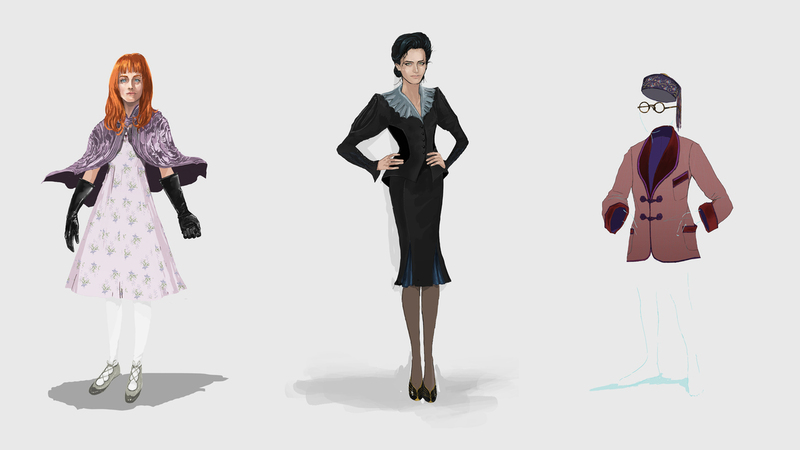 Above are Atwood's sketches for characters from the Miss Peregrine's Home for Peculiar Children. Something else that shaped Atwood's career — she got pregnant when she was 17. She didn't graduate from high school with her class. To help support her baby and her husband, who was in college, she worked at a French fry factory. "I was cutting the black spots out of potatoes in rubber gloves on swing shift," she says. "So, you know, that was really a mind blow for me at age 18. To think 'this is it.' Because, for a lot of people I was standing next to, this was it." 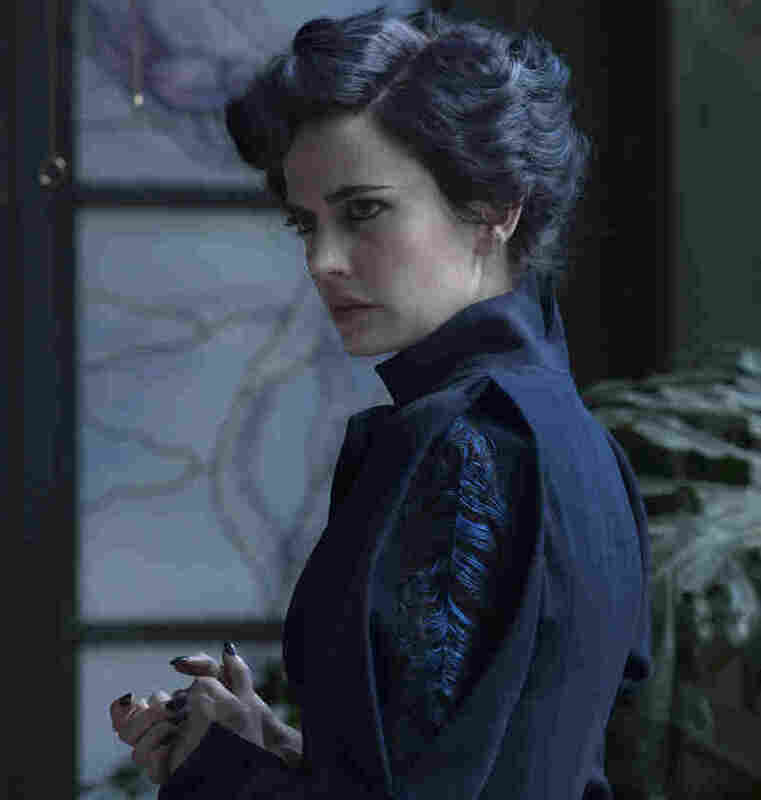 Atwood looked long and hard for the deep blue fabric in Miss Peregrine's dress. "I was looking for a blue that didn't photograph black," she says. But Atwood got a scholarship to attend Cornish College of the Arts in Seattle. Then, she moved across the country to New York, where she found work in TV wardrobe departments. Her first solo costume designer credit came in 1984 on Firstborn, starring Robert Downey Jr. and Sarah Jessica Parker. The movie wasn't a hit but it quickly lead to bigger and better jobs, such as designing costumes for Michelle Pfeiffer in Married to the Mob and Natasha Richardson in The Handmaid's Tale. 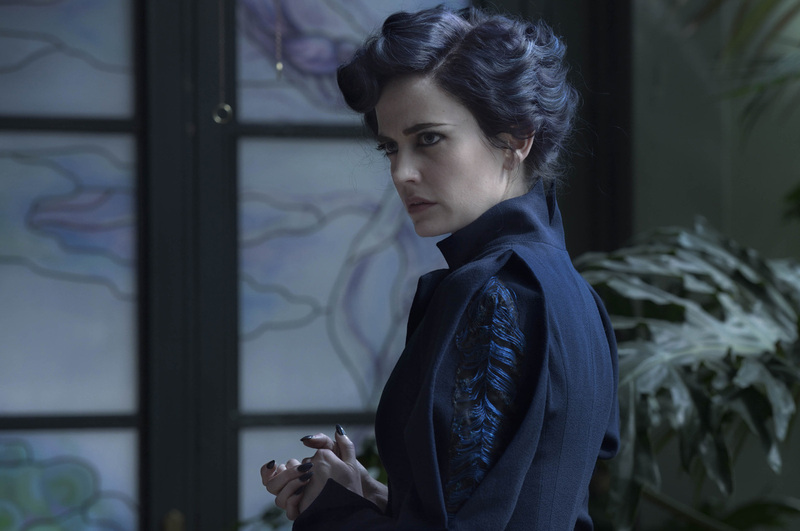 For Miss Peregrine's Home for Peculiar Children, Atwood says she looked carefully for the deep, vibrant blue of Miss Peregrine's dress. "It was like a hard blue to find, I have to say, because I was looking for a blue that didn't photograph black," she says. "Even though today I read a review of it and it described it as her 'black dress,' and I was like 'Ugh.'" But Atwood is not precious about her work even though she's known for sweating the details. "I was around people that worked in factories, people that worked in restaurants, people that worked in stores. I was around fashion snobs. I was around a lot of different people," she says. "In my work, when I get a job and somebody is described as 'a waitress and a mother, I kind of know what their life was really like and what they really looked like and how they lived and I think that really helps me in my work." Designing the costume, says Atwood, is all about understanding the character.